1322 pages, 14.33 x 15 x 32"
The photos in this book came from the incredible cactus forest of Las Bocas and the surrounding areas in Sonora, Mexico. Pitahayal, as the area is called, comprises a number of cactus species in which Stenocereus thurberi predominates. It is located in an area of coastal thornscrub, near the Mayo fishing village of Las Bocas. These cacti are very significant to the lives of the Mayo people who rely on the wood of the cactus as building material for their homes and fences. The luscious fruits that the cactus produces in late summer are also an important part of their diet. From June of 2010 thru August 2011, I lived and worked in Sonora with the generous support of a Fulbright Garcia Robles Research Scholar grant. My studio/ research station was located in the village of Yecora from June through November2010. Then I moved to Las Bocas where I worked until my return to Hornell, NewYork, in August 2011. I had first visited this area the summer of 2008 when I fell in love with it and began to plan my return. I started photographing these amazing cacti in November 2010 and continued through my stay until early August 2011. I selected the images literally from among tens of thousands. 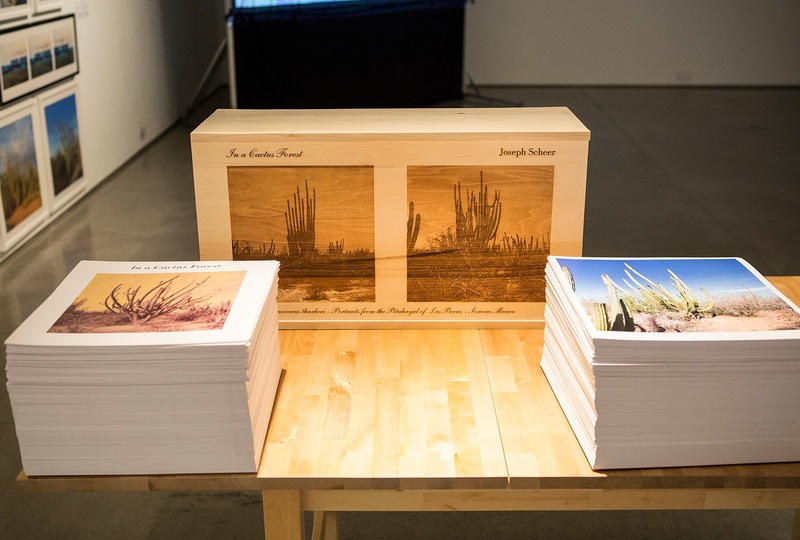 The images depict the cacti at different times in their growing season. The area has a very dry and dormant spring before a late summer monsoon turns everything bright green. The cacti bloom begins in late February then accelerates until just before the monsoon season, which starts in July when the fruits ripen. The “square” format of the images comes from combining two frames using panorama-stitching software. This also allows for the capability to print finished images in a very large size. The images explore different qualities of light and atmosphere. As often as possible, I tried to photograph in the clear light of the mornings or in the warm glow of late afternoons. Some images show the harsh midafternoon light on days when the temperature exceeded 100 degrees Fahrenheit. In March dust storms gave a grey yellow cast to the sky. During May and June, the pre-monsoon season, the dazzling sky was deep dark blue. As the monsoon approached in July it began to cloud up and new challenges emerged in photographing these spectacular cacti. During the dry season the scrub among the cacti appeared in tangled messes of often-thorny branches until they burst into bloom and joined it the spectacular leaf out. Hi Joseph, We crossed paths when you were working in Yécora, I was with Gert and Eduardo collecting mushrooms in the area. I'd like to know how I can get a copy of these pictures, my dad is from Las Bocas, andhe will be very happy to see your work! Send me your address and I will see what I can do!